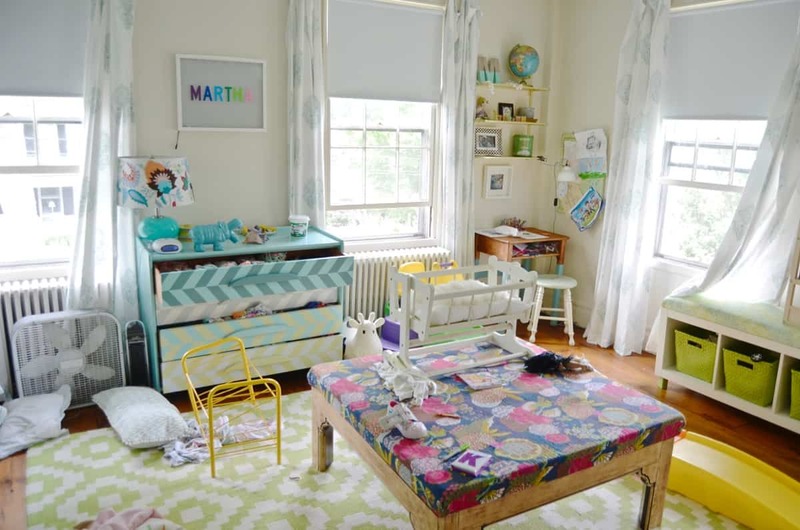 You know how I sometimes post a shiny pretty “room reveal?” (I have a whole page of ’em right here!) Man, those rooms are nice. Tidy. Not a rogue sock or dust bunny to be found. 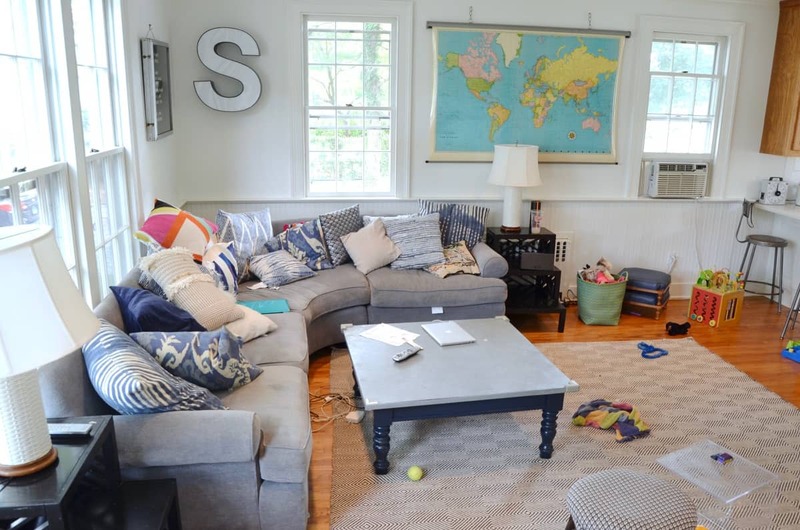 That’s basically the norm around here, but today my friend Chelsea from Two Twenty One challenged us to DIG DEEP and try our hardest to show our normally pristine homes the way one might “imagine” a regular ol’ house would look. Just so we’re clear… this was a STRETCH. Let me know what changes you might make to achieve that “keeping it real” look… I’m afraid I’m a little out of my depth here. This is clearly how our foyer looks on a daily basis. Clean. Bright. Clear. Free of debris and left shoes. 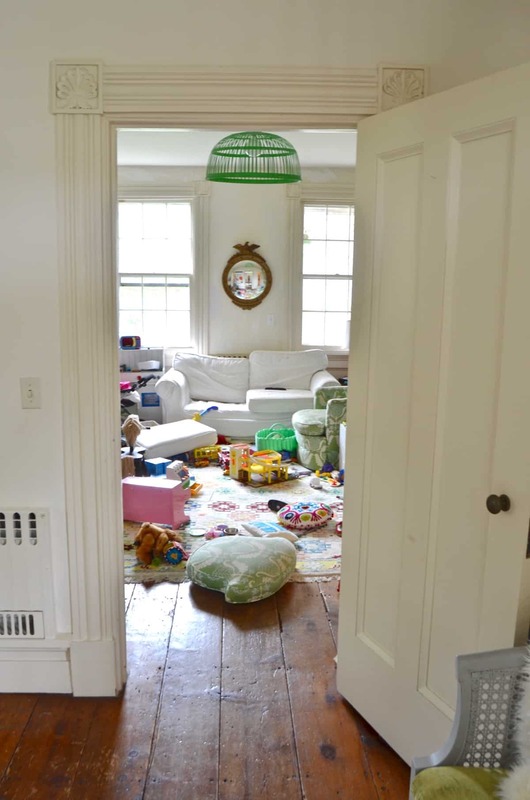 Such an open space is probably where 4 small children would gravitate to, right? I figured they’d set something up that could be run across to take full advantage of the space. 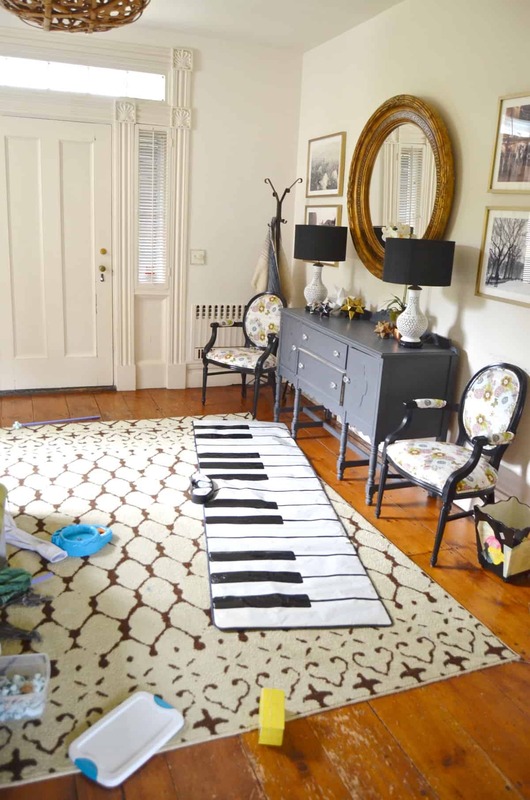 Not that I’d know, but I also bet they’d enjoy how LOUD that piano might sound from the top of the stairs right there. This is our newly painted living room and I LOVE how bright and clear the light is now… Those white walls make EVERYthing better. I was more subtle in here… slim evidence of children… but still something. Always something. Whether a car under a chair or a travel game of Hungry Hungry Hippo on the coffee table, that’s the unexpected little ‘pop’ of children I was going for. Onto the dining room. I finished this space for the One Room Challenge, and it’s basically a showpiece at this point. People come to our house just for a glimpse of the navy walls and the macrame. 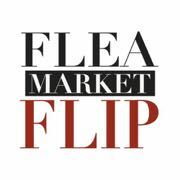 For the Keeping It Real version, I brought in an eclectic array of craft projects and flea market purchases. It can be hard to mix and match like this, but play around until you strike the right balance. 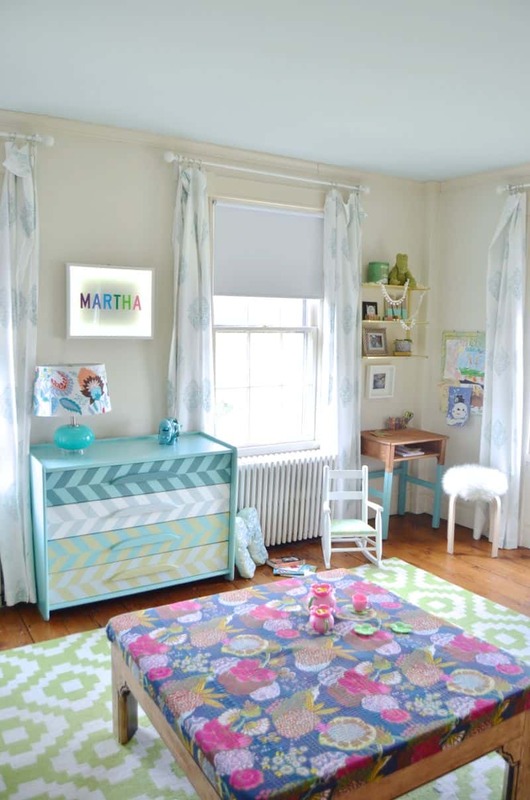 This fuchsia girl’s room is one of my favorites. Eleanor picked out the colors and helped me bring in a new desk. She’s a real minimalist, but I suspect as she gets older, she will find a thing or two to use that extra storage for. I decided to go for a robbery-ish look in here… I wanted the space to feel chaotic with a ransacked texture and the color palette of larceny. 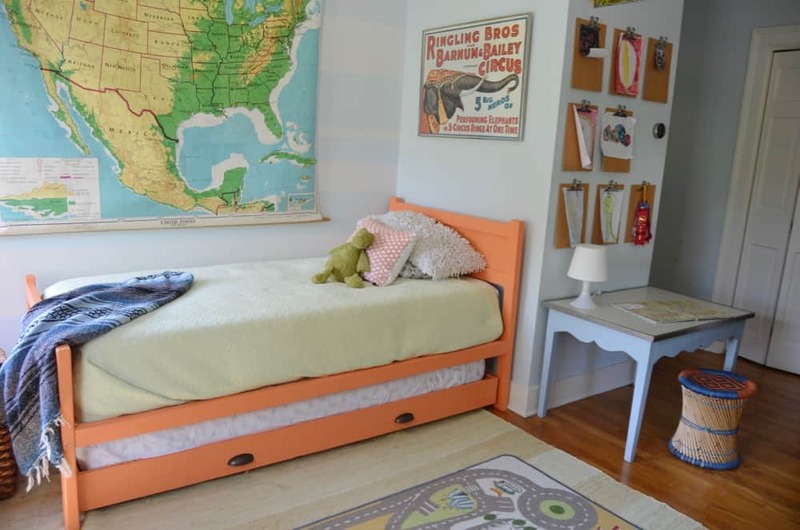 The newly built trundle is one of the kids’ favorite places these days… Oliver’s flea market-filled bedroom is a hang out for the kids and they take turns spending the night in there. 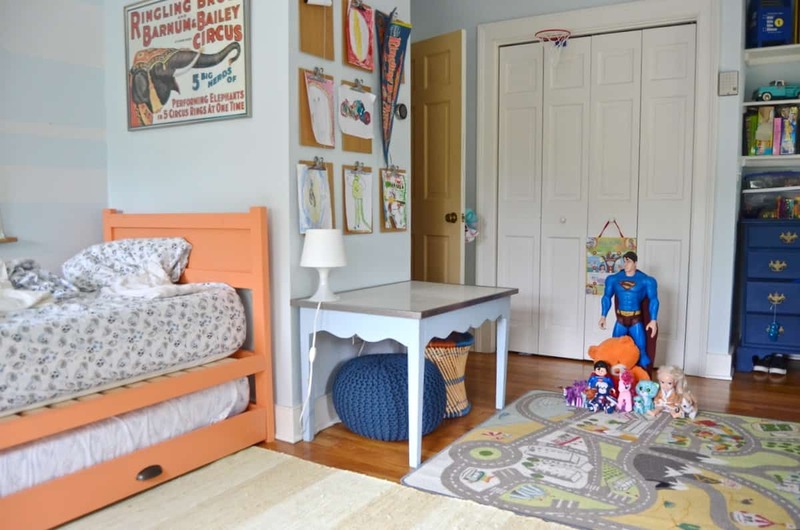 For a little boy who loves superheroes… it seemed natural to bring in some ‘heroic’ elements to his space when “Keeping It Real.” His rumpled and unmade bed was intended to compliment the disarray on the opposite side of the room. This boho room has always been one of my favorites. 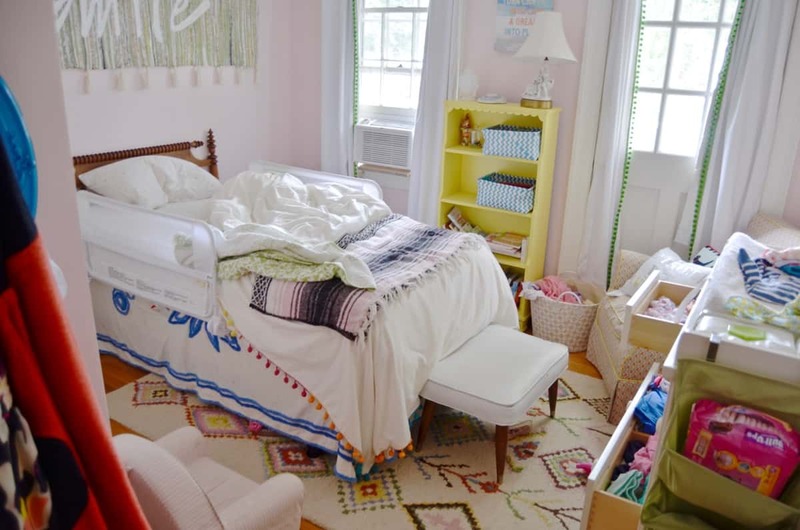 This spring Louisa asked for a ‘big girl’ bed, so I brought in that thrifted beauty. She’s a happy camper and will spend hours carefully arranging her pillows and organizing her books. 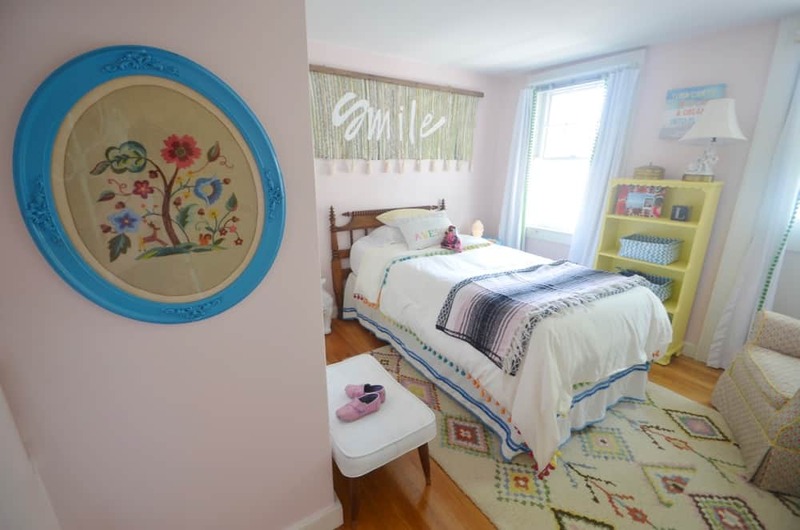 Because the vibe in here is colorful and diverse, I used feng shui when placing things like her package of pull ups immediately inside the door and the full basket of laundry by the window. When Martha asked for her own desk, how could I resist?! We made this thrifted cuteness together and she will often retreat for a quiet non-belligerent moment to herself up here. I used a technique for this space that I discovered on YouTube. I put on a blindfold and move slowly around the space shifting and scattering things as I go. The trick is to train your body to stay in motion as you manipulate the space. This is one of the only neutral spaces in our home… it started with a DIY headboard and a TJMaxx rug… I shared the reveal here! I haven’t played around with laundry too much in this Keeping It Real tour, and the master seemed like a suitable spot for an installation. 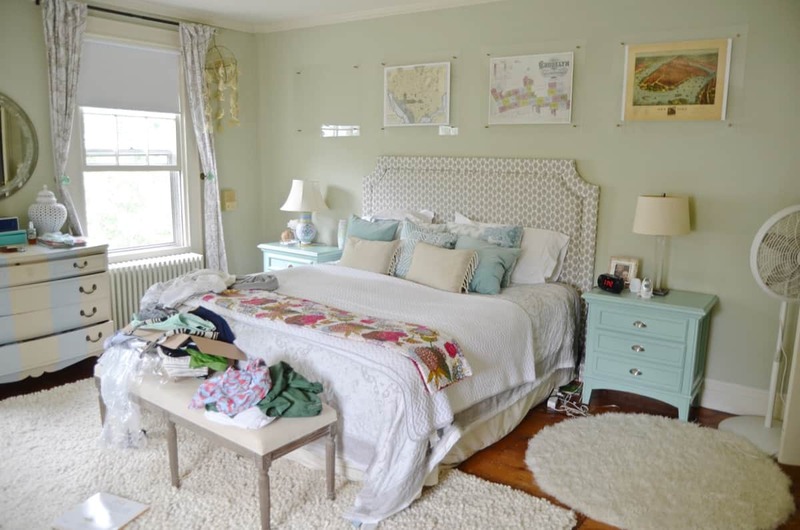 I used the bench at the foot of our bed, and then tried to complement that ‘volume’ with the open book on the rug and the accents on the dresser. The missing map above the bed is a metaphor for a project yet to come. Last but certainly not least, is our family room. 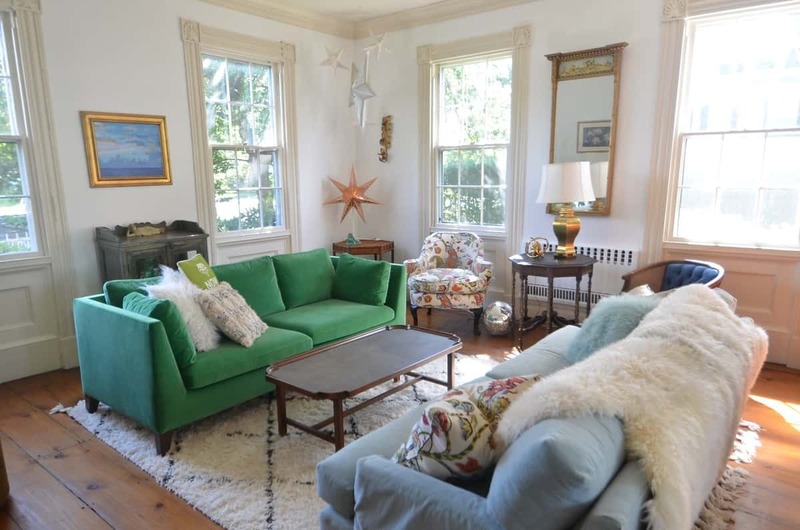 As I sit here typing, the coffee table has a lovely vignette with a tray and a stack of books and some brass animals and an orchid; the couch is draped with a cozy tassel throw blanket. Have you ever heard of the rule of threes in design? For the Keeping It Real photo shoot, I gathered items in odd groupings to keep the eye glancing around the space. Note that window AC units are always a nice way to block light and bring in an industrial detail. Here’s where the fun begins! 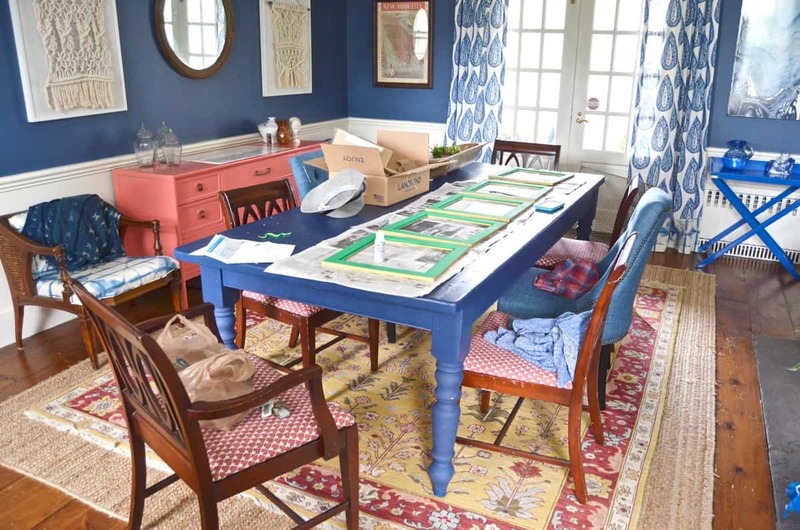 There are a handful of other bloggers who have also offered to put together a “real” house tour for you! 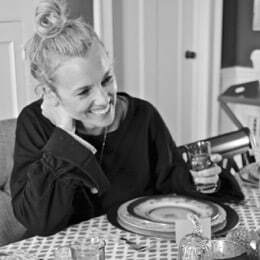 I’m SO excited to see what creative elements they’ve added to their homes… dirty dishes displayed in the sink? Underwear accessorizing the bathtub? Legos peppered into the decor? You’ll have to see for yourself! Gifted these gals are. Gifted! Your house looks like a real house for sure in this post! It’s nice to see that you live like the rest of us! Thank you all. I really needed this. I’ve been so depressed and unmotivated about the condition of my house for a while now. Please, sister. I’m right there with you. There are moments when I realize how BLIND I am to my own clutter… taking pictures actually forces me to see things, but 99% of the time, there’s a toothbrush on the mantel or a toy car in the sink. New subscriber! Your post was hilarious! 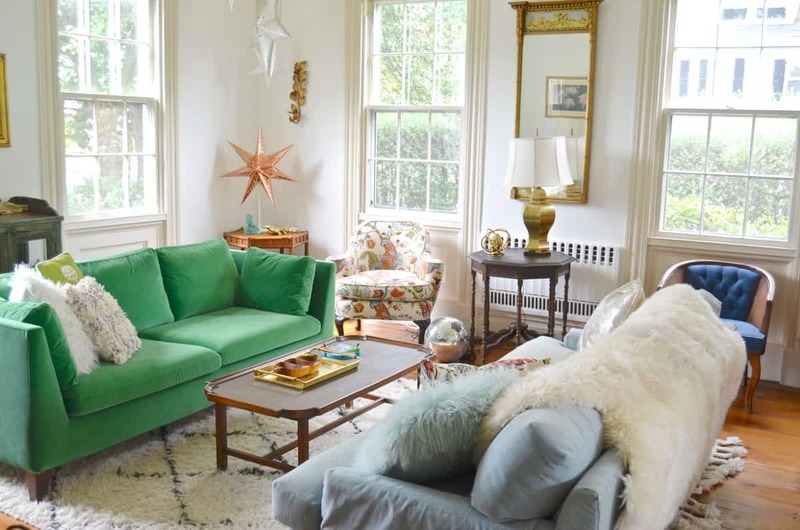 Thanks for living life and sharing the not so perfect look of a house happily lived in! I especially loved your before and afters! Yay!!! Thanks, Monica! Isn’t this the most fun?! I was joking with Chelsea that I want to make my whole blog “keeping it real”… would make my life much simpler! 🙂 Ha! Love your decorating!!! The keeping it real photos are so uplifting to all of us that are less than obsessive at keeping our home picture perfect. Thanks for sharing. Found you from Bower’s blog. This was tons of fun. I’ll be back. I had no idea I was stylish either! However, I think I have room to improve. I don’t have any mismatched socks (because I only buy one kind!) but I think the random puzzle pieces might make up for it. Am I right? Charlotte, this was so good! I literally LOL’ed at the robbery-ish look in Eleanor’s room! That’s the same look I’ve been going for in my whole house! Such a breath of the fresh air to see homes really being lived in in this sometimes too perfect blog world, isn’t it? I was laughing with Chelsea telling her that half the group had some sort of snot sucking mechanism on their counters. Turns out… I’m VERY good at the REAL home tours. 🙂 Heehee. The bench at the end of my bed is such a love hate relationship because I love it but can rarely see it. YES!!!! This is everything. Sometimes I want to show behind the photo everything I shoved out of the way to make it beautiful. HA! Yep… I’m going to adopt that look for ALL our rooms! Laundry will be much easier! I love your humor and witty writing for this post. You did a great job. Thank u for agreeing to post what real life looks like. As a blog reader I see a ton of spaces and I get disheartened by how perfect they all look and then want my house to look like “that”. But to see all your real life posts it’s made me realize that no ones perfect. Thank you!! Thank you so much! I know MANY bloggers and what I’ve learned is that we are just better and moving things out of the way for pictures. 🙂 Thanks for reading! Thank you so, so much for this! 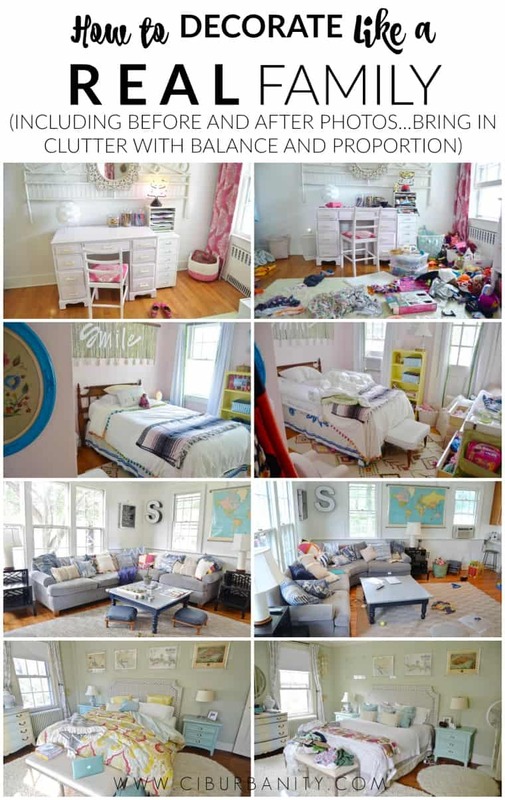 Your house is STILL way neater than mine, but it looks a little closer than all the “perfect” houses on blogs. I love those too, the inspiration is super, but always makes me feel a little down about myself. Working full time, two teenagers, 2 dogs, 2 cats-ugh, it’s always a mess around here! Love your carefree spirit, Charlotte! 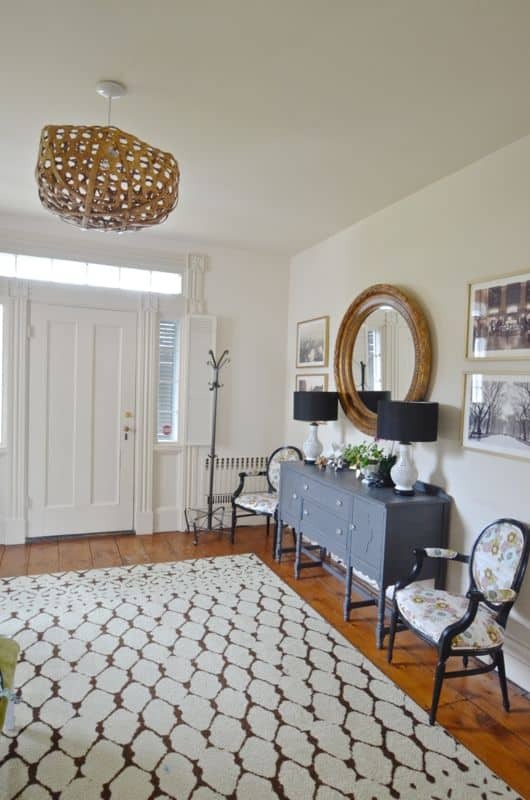 Your staging abilities are impeccable !! This post was so refreshing, it’s good to see you live in your home. This is very much appreciated. Thanks. Haha – I love your master bedroom! Off to go see if there is a post about it. I so relate to all your “real” after rooms! Mine never get to the before stage anymore, where they actually look picture perfect. And because I use the balcony to shoot photos, I’m never enticed into cleaning up the mess. Hopefully, this will all change once the cooler weather forces us indoors . 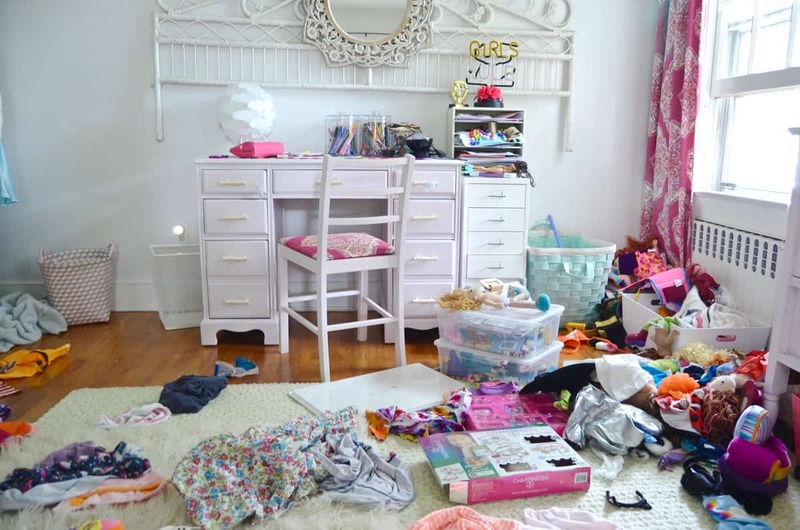 Is it just me or are the girls messier than the boys, or do they just have more stuff? Your real post was the best yet! Thanks for sharing in such an inventive and hilarious manner. I always enjoy your blog. Awwww… thanks so much! It was a super fun post to write!! 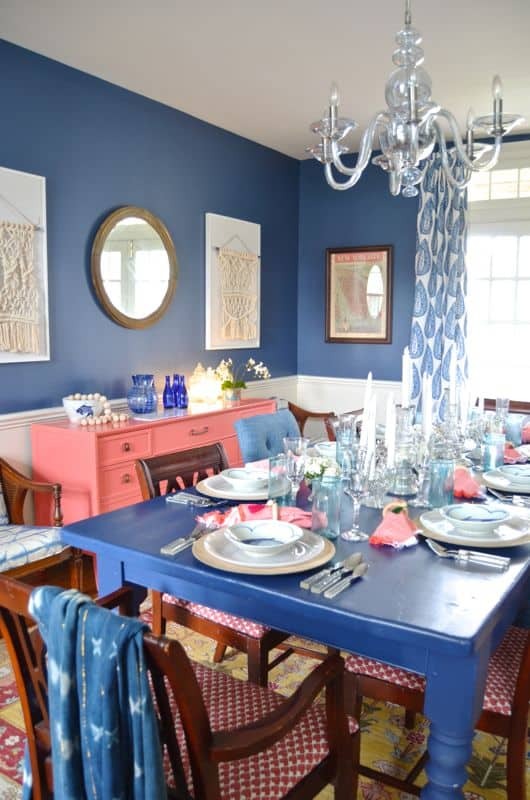 Your dining room is the story of my life!!! 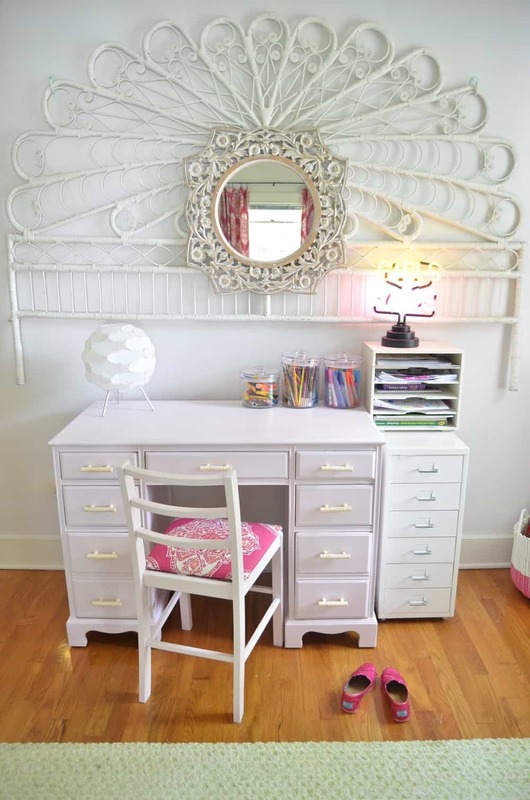 One space gets finished only to be immediately filled with items from other spaces for projects! Thank you, thank you, thank you. This series completely restored my faith in blogs. I’ve been an avid reader for years, but I miss the “real” home feel that blogs used to provide in comparison to magazines. Thanks for pulling back the curtain, and reminding me how normal we all are. OOOPS! Somehow my computer “jumped” a column or 2. I have several tabs open and somehow got to the comment box in the wrong place. Realized this was supposed to go to Katie…so please delete it. So sorry!! HAHA! I know exactly the post you’re talking about on Katie’s site! 🙂 It’s hilarious. No worries!! Thanks, Linda! We had SUCH a fun time with this ‘house tour’! Totally cracking me up! Hysterical! 🙂 Thanks, Hillary! I had a fun time reading through everyone’s too!